• During #FlagshipFebruary Anchor Public Taps will be serving Unfiltered Steam Beer on tap — a rare and delicious offering! It’s the Anchor Steam Beer you know and love, but unfiltered. If you ask any Anchor Brewer how they like to drink Anchor Steam they’ll say, “straight from the cellar tanks.” This beer is us extending that experience to you. • Also during the month of February, Anchor Public Taps will have an Anchor Steam pint punch card program. Track each pint of Anchor Steam Beer you drink in February on the card; if you get 10 pints you’ll get a free Drink Steam t-shirt! • Enjoy specially priced Anchor Steam Beer on tap every Wednesday and trivia night during the month of February. • Enjoy specially priced Anchor Steam Beer every happy hour during the month of February. • Enjoy $4 pints of Anchor Steam Beer every happy hour during the month of February. 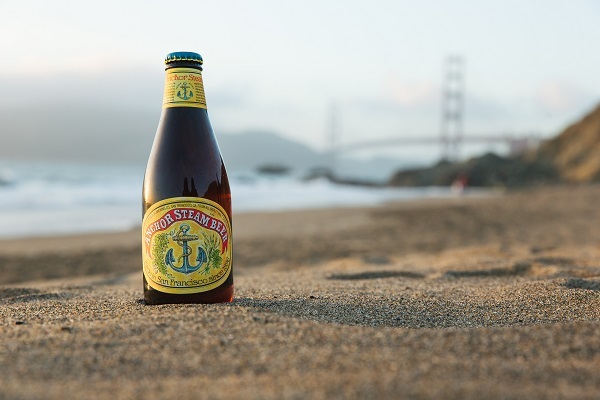 • Enjoy fresh Anchor Steam Beer on tap during the month of February. • Enjoy $5 pints of Anchor Steam Beer during the month of February, souvenir glass available while supplies last. • Enjoy fresh Anchor Steam Beer on tap during the month of February, souvenir glass available while supplies last. • Enjoy $6 pints of Anchor Steam Beer during the month of February, souvenir glass available while supplies last. See server for details. • Enjoy fresh Anchor Steam Beer on tap during the month of February! • Enjoy Anchor Steam Beer on tap during the month of February, souvenir glass available while supplies last. See server for details. • Enjoy Anchor Steam Beer on tap during the month of February, souvenir glass available while supplies last. • Enjoy $6 pints of Anchor Steam Beer every happy hour during the month of February. • Enjoy half-price pints of Anchor Steam Beer every happy hour during the month of February (excludes holidays). • Enjoy $4 pints, $6 20oz glasses, and $15 pitchers of Anchor Steam Beer during the month of February. • Enjoy $1 off pints of Anchor Steam Beer every happy hour during the month of February. • Enjoy $5 pints of Anchor Steam Beer during the month of February.